Opulence and high mechanics ruled the halls of Baselworld 2016 for ladies timepieces. iW Managing Editor and resident ladies category expert, Nancy Olson, compiled some of the most memorable ladies watches from this year’s show. She notes common themes among the models, including historical roots and decorative design with unique materials. Read on for more on Blancpain, Breguet, Fabergé, Dior, Hermès, Rolex, Harry Winston and Patek Philippe. Though I’d seen captivating pictures of the new Ladybird, the “real thing” is indeed a stunner. At the time of its original launch in 1956, the Ladybird was powered by what was then the smallest round movement on the market. And this year, as the Ladybird turns sixty, Blancpain is introducing a new limited edition of sixty pieces featuring an elaborate dial motif. The 21.5mm white gold watch is set with thirty-two diamonds on the bezel and eight diamonds on the mother-of-peal dial, while inside is a self-winding movement with silicon balance spring. As a huge fan of Breguet (who isn’t?) 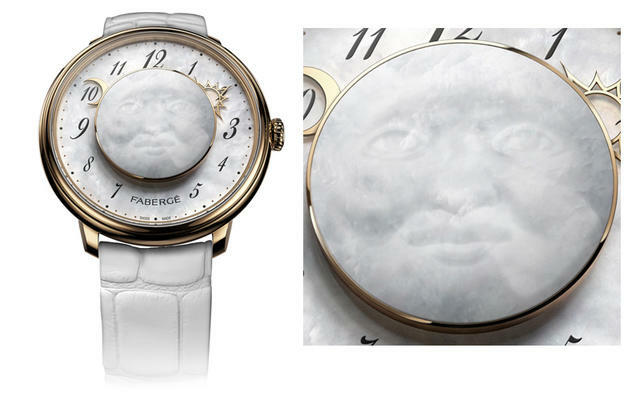 I was looking forward to seeing the new 30mm Classique Phase de Lune Dame 9087 with its white grand feu enamel dial featuring a moon-phase aperture at 6 o’clock. Brilliant-cut diamonds grace the bezel and lugs of this white gold timepiece, which is also available in rose gold or with a mother-of-pearl dial. 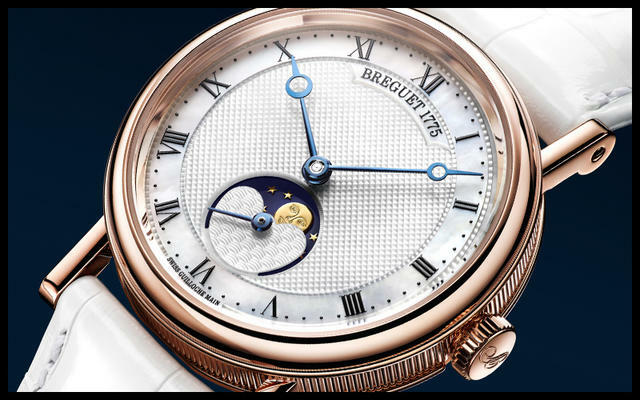 Inside is the self-winding Breguet 537L caliber visible through the caseback. Purely elegant is the only proper way to describe this watch. The new Lady Levity from the Dalliance collection is inspired by a rock crystal desk clock created by Fabergé workmaster, Henrik Wigstrom, in Saint Petersburg around 1910. This wristwatch is powered by the Agenhor-produced AGH 6911 caliber conceived by modern-day horological workmaster Jean-Marc Wiederrecht, founder of Agenhor (also responsible for last year’s Fabergé Lady Compliquée). The 36mm platinum watch employs stylized indicators to display the time on the peripheral dial: a crescent moon for hours and a rising sun for minutes. Embroideries as might be observed through a kaleidoscope are the inspiration for this new series of eight unique pieces in the Grand Soir collection, now at 36mm. 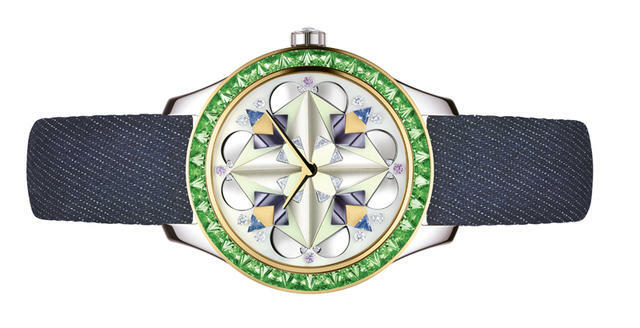 The architectural dial shown here is embellished with mother-of-pearl, gold petals and precious stones while the bezel is set with geometrically shaped stones. Inside is an Elite automatic caliber by Zenith with an openwork spiral caseback revealing a lacquered oscillating weight complementing the dial. The watch comes on a denim strap—a fetching juxtaposition of casualness and quintessential Dior aplomb. 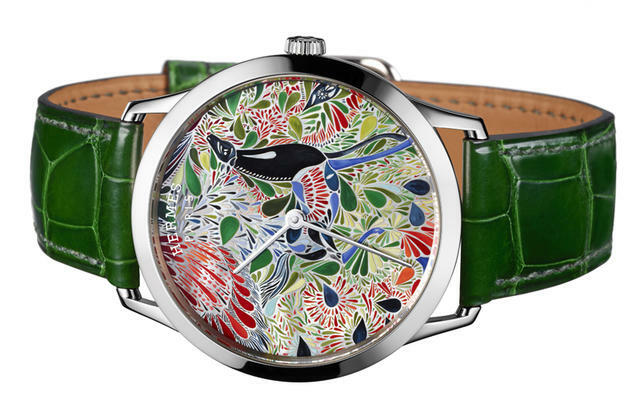 Entirely crafted within the in-house workshops, the Slim d’Hermès Mille Fleurs du Mexique draws its dial inspiration from a Hermès silk scarf by graphic designer Laetitia Bianchi. In my opinion, the stunning hand craftsmanship is best appreciated “in the flesh,” as the hand-painted mother-of-pearl dial comes to life in gorgeous color. 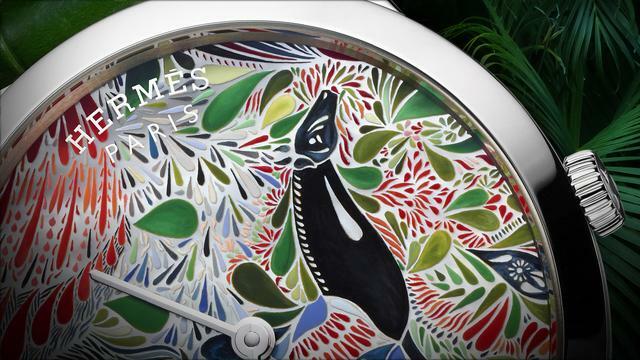 The motif features lifelike cut leaves and flowers reminiscent of the 15th and 16th century tapestries after which the watch is named. This 39.5mm white gold timepiece is part of a six-piece limited edition, each driven by the self-winding H1950 movement. 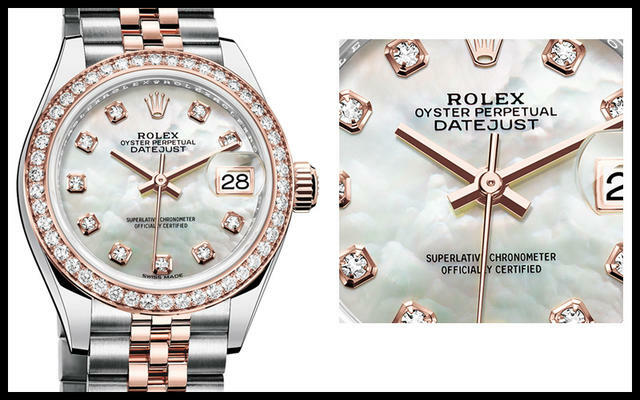 Rolex is introducing the new generation of its Oyster Perpetual Lady-Datejust in either yellow or Everose Rolesor versions or a combination of 904L steel and either 18-karat yellow or Everose gold. These models feature a redesigned case enlarged to 28mm and a mechanical movement, caliber 2236, equipped with a Rolex-patented Syloxi hairspring. The new size serves it well. The Premier Precious Weaving Automatic 36mm features a Japanese technique in which threads of gold are woven with slivers of natural mother-of-pearl to create a unique tapestry. There are just thirty pieces in each of four variations. 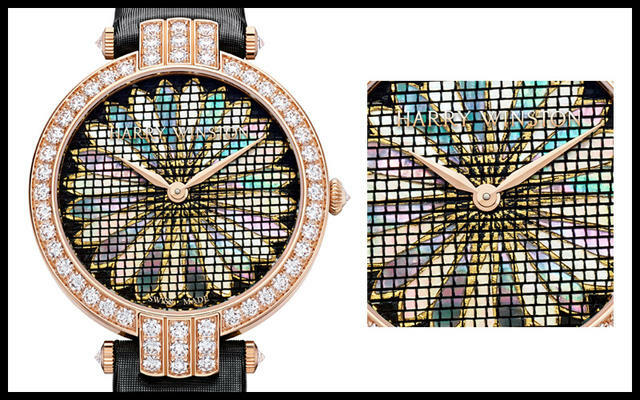 Shown here is the rose gold version with a woven chrysanthemum dial décor. The Premier collection was introduced in 1989 and was designed to showcase the brand’s expertise in rare artistic crafts. 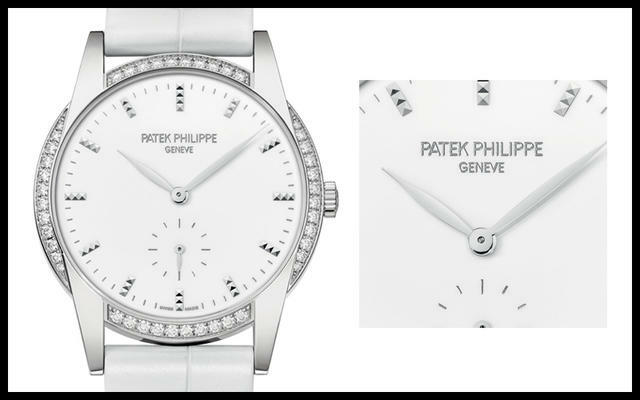 Patek Philippe is debuting the Calatrava, Ref. 7122 (replacing the 7120), for ladies. The diamond-set gold watch is powered by the manually wound caliber 215 PS with a Gyromax balance and Spiromax balance spring, and the case measures in at a new 33mm size. The white lacquer dial features applied hour markers and leaf-shaped hands in 18-karat gold to match the case. Subsidiary seconds are indicated at 6 o’clock. Pictured is the Timeless White, Ref. 7122-200, on a white alligator strap.